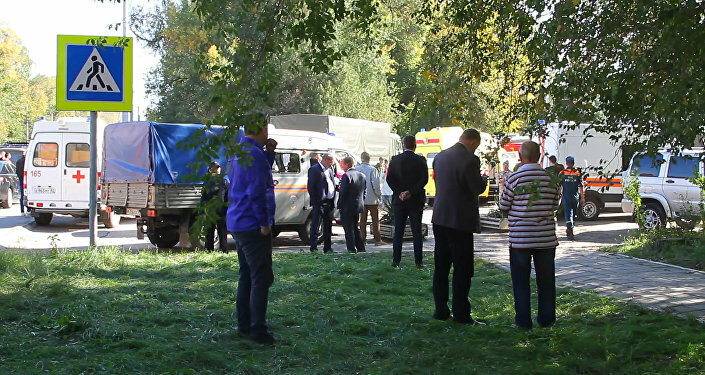 "What we can see now are the injuries caused by a blast of an improvised explosive devise filled with small metal items, washers and other items, round and square ones," Skvortsova told reporters in Kerch late on Wednesday. The minister noted that the victims' bodies had been thrust with these metal items that had been infected, immediately provoking severe inflammation. Those wounded had no gunshot injuries, Skvortsova pointed out. "Apparently, when [the attacker] fired at point-blank range, these people were unfortunately killed," the minister stated. The minister added that 12 of those wounded in the attack had sustained moderately severe injuries. "Patients will be evacuated to Simferopol. All the conditions have been created for this. And several people [will be transported], perhaps, to the Krasnodar regional hospital," Skvortsova added. Skvortsova subsequently said in a statement, issued by the Healthcare Ministry, that two aircraft had been ready for evacuating those injured in the Kerch college attack. The same statement noted that there had been enough medicinal drug in Kerch to treat those wounded in the attack. Meanwhile, the deputy head of the city administration said that four of those killed in the attack have been identified, noting that three of them were children.